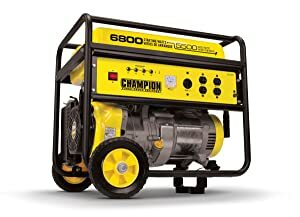 Champion 6800 Watt Generator - the best CARB compliant generator? They say experience is the best teacher. You learn a lot about something after you have seen or used it rather than simply hearing about it. 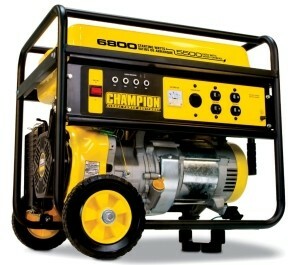 Similarly, generators are many but opinion on Champion 6800 Watt Generator is a really good one. Right from its color, design, features and functionality, this generator does its job very well. It is suitable for a variety of applications including those that consume slightly larger amount of energy. I will show you what makes this generator stand out in the following review. 6800 Watt Power Range – This generator is capable of producing maximum power of up to 6,800 watts output. This simply tells you it is able to power plenty of home electrical appliances as long as you don’t decide to plug in some larger power consuming devices. Many outlets– It includes 2- 120V duplex outlets (5-20R) 1,120/240 Volts twistlock (L14-30R) outlet which allows you to connect it to various appliances at ago. It gives you the freedom to choose which outlet to choose. In addition, in case one fails; you can always use other outlets. Large engine capacity – it is powered by 338cc OHV engine with cast iron sleeve. This allows you to fuel its tank with much fuel for long and extended use. It can run for more than one day upon a single fueling session depending on the load size connected. Long running time – On full tank gas at 50% load, this model can run for up to 11 hours. You are therefore assured that during this entire duration, there will be no power disruption because the generator will still be running smoothly.In addition, it includes oil engine for lubrication purposes to enhance its longevity. Excellent dimensions – It measures 31.3’’ by 20.9’’by 22’’ hence can fit in relatively lesser space. This allows you to keep it in your house because it is not too big for house storage. CARB compliant – Champion 41135 is compliant with the requirements of California Air Resources Board (CARB) which advocates for most environmentally friendly generators. You are therefore sure that you are buying a generator with minimal environmental pollution. Recoil start – Its recoil start is easy to pull in order to start up the generator. It requires very little effort to do it, making it easy for everyone to use. Produces massive power – I developed a special liking for this extraordinary generator because of the immense power it produces of up to 6800W. This is enough to power most of the basic home appliances even if they are connected in a bit larger number. Large engine capacity – this generator can accommodate quite significant levels of fuel. Once you fill it to capacity, you can proceed with your errands without much worry. Reliable – ever since it got its way into the market, there have not been any complaints from customers about a possible break down or defect. If you buy it, you are sure that you have a reliable product. Easy to start – the fact that you only need to pull the recoil start and your generator begins to run makes it worth being liked. You don’t have to be taught how to pull it. In other words, it is user friendly hence the best fit for you. Easy to maintain – this really makes me like the generator because the oil engine it comes with is easy to apply and helps to lubricate it for longevity. CARB compliant – if you are environmentally conscious, you will definitely like this generator because it produces less exhaust fumes. In addition, just like in the case of other Champion generators, you can use it in states like California which strictly adhere to such environmental policies. Its large engine capacity implies that it consumes much fuel hence making it rather costly to maintain. Could be a bit quieter. There are portable generators which performed better on this matter. To sum up, this generator is a good quality product. It has all that takes to qualify is as a versatile portable generator. No wonder it is usually well rated in most expert reviews, most of which I have to agree with. It is for those who are willing to spend a bit more to get much more in use value.